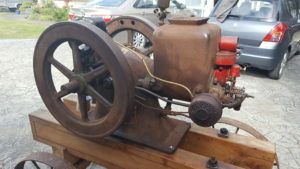 This Mogul 3hp engine came from Ron Thornally in Tapanui in a sad state, purchase price $100. While it was mostly complete it was stuck solid. I had it soaking for a number of years in a variety of fluids. With the addition of some brute force it finally came apart in November 2016. I already had the trolley, now the engine to mount on it! Thanks to Cliff Bond Engine Reconditioners in Christchurch they were able to clean out the bore plus make new rings and reseat the valves! The missing bits I was able to obtain from a “spare”. A Mogul in worse condition! With a deadline of the club rally the end of January 2017 it was all hands to the pump and thanks to my friend David Holmes we had it going the Wednesday prior, oil leaks and drips sorted on the Thursday and delivered to the show on Friday. It ran well all weekend. I will leave it unpainted. Here is a short video of it in action at Higgins Park Jan 2017 driving the corn sheller.